We’re going inter-continental to bring you the inside scoop on the newest models from Continental Tires. In addition to their already existing tire lines, Continental has released the new PureContact LS and TrueContact Tour tires – both upgraded spin-offs of their original versions. Created for sporty coupes, economy, and compact cars, the original PureContact from Continental is an ideal Grand Touring All-Season tire, featuring long tread life and low rolling resistance. With PureContact tires on your car, you’ll enjoy a safe and comfortable ride as well as money saved at the pump due to fuel-efficient features. Its siped tread provides biting edges for an excellent overall grip and computer-optimized asymmetric tread greatly reduces road noise. Across the board, the PureContact tire has many quality features that put it ahead of the all-season tire competition. But like any tire manufacturer that strives for total perfection, there’s always room for improvement. And that’s what sparked Continental’s introduction of the PureContact LS tire model. The PureContact Quick View Indicators will show Tuned Performance Indicators, which notify the driver when the tire is performing less than ideally in wet, dry, or snowy conditions. Additionally, the Alignment Verification System lets you know when its time for an alignment. Designed specifically for luxury cars and luxury sports cars, the PureContact LS is available in 29 sizes from 16-20”. The second tire in the contact family to benefit from some major performance improvements was the TrueContact tire. The Continental TrueContact tire is a standard touring tire developed for coupes, sedans, minivans and CUVs. Featuring Continental’s EcoPlus Technology to extend tread life, fuel efficiency, and maintain wet braking grip, these tires provide all-season traction in wet, dry, and wintery conditions. Despite its already excellent performance features, Continental found several ways to improve on the original design. The new TrueContact Tour is now Continental’s longest lasting all-season tire. The TrueContact Tour is available in 45 sizes ranging from 15“-19“. So, what’s the secret behind the newest improvements to Continental’s leading touring tires? 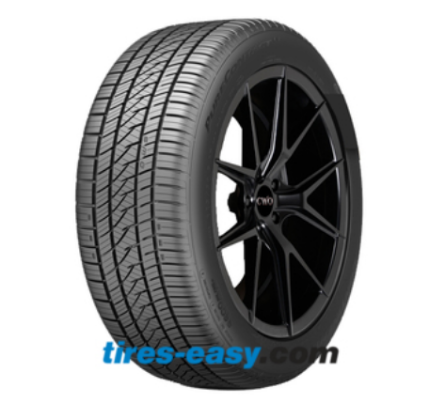 Both new models are now available on tires-easy.com along with the original models from Continental. Whether you drive a luxury vehicle, compact SUV, or something in between, there’s an all-season touring tire designed just for you. The PureContact LS and TrueContact Tour cater to any kind of driver and boast unparalleled performance features, which will carry you for miles in any weather condition. Low Rolling Resistance Tires: Are They Worth A Shot?